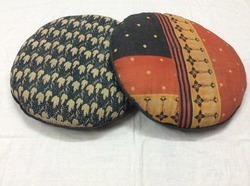 Established in the year 1989 at Jaipur (Rajasthan, India), we "Bhavya International", are recognized as prominent manufacturer, exporter and supplier of a qualitative assortment of Kantha Cushion Cover, Patch Work Scarf and Designer Bed Sheet etc. Our offered products are designed using the best grade fabric and other allied material under the guidance of our skilled professionals. Designed as per the set industry standards and norms, we also assure to meet the product requirements of clients. The offered products are appreciated among clients for the features like softness, tear resistant, light weight, colorfastness, smooth texture, high strength and long lasting sheen. Our valuable clients can avail these products from us at the most reasonable price range. We are supported by a huge infrastructure that is constructed over a huge area of land. Divided into assorted units like manufacturing, quality testing, sales & marketing, warehouse-packaging, our infrastructure is well connected with all the major means of transportation. We export our manufactured products to our valuable patrons in UK and USA. Our well-established infrastructural facility makes us capable of manufacturing and supplying outstanding range of products. We have recruited a team of skilled professionals on the basis of their qualification, expertise and knowledge in their working domain. In order to keep updated our team with the latest developments prevailing in the industry, we conduct various trainings and seminars. Our talented team works in close-coordination and supports each other for constant business growth. In order to achieve maximum client satisfaction, our experts work in close harmony with clients and direct their endeavor towards offering premium quality wears.